I drew inspiration for this project from this topic and this site. 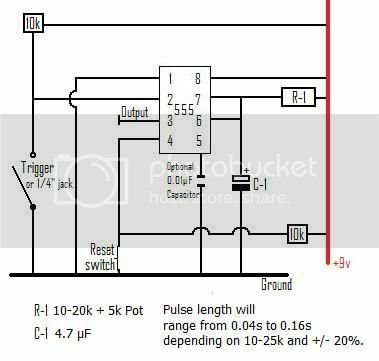 The pulse length varies as T = 1.1 � R1 � C1. I'm going for approximately a 0.125s cycle, probably less, so .125 ~> 1.1(20000)(0.0000047). I'll be using a 15k resistor with a 0-5k pot. I'm also allowing +/-20% because the 4.7uF capacitor is electrolytic. I'm just starting out in electronics, but can anyone tell me if this circuit will do what I think it will? I want it to send a brief, timed pulse every time the key (trigger) is depressed. I think I've got the timing down, but who knows? I may not have the battery wired correctly. Thanks, and I'll let everyone know how the circuit works once I put it together. from what i knew the 7 and 6 pins should be hooked up to eachother. the batery is wired wright. Does it work properly now? ?